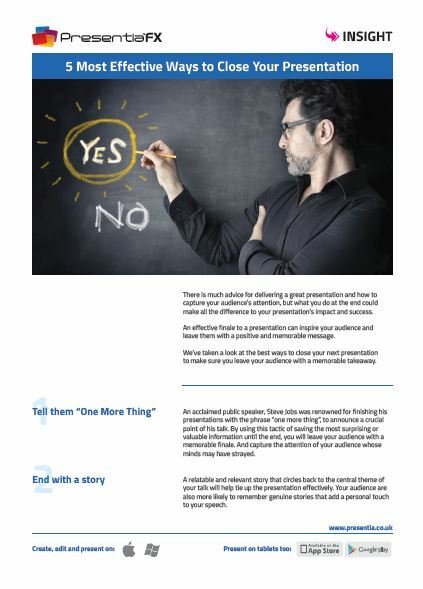 There is much advice for delivering a great presentation and how to capture your audience’s attention, but what you do at the end could make all the difference to your presentation’s impact and success. An effective finale to a presentation can inspire your audience and leave them with a positive and memorable message. We’ve taken a look at the best ways to close your next presentation to make sure you leave your audience with a memorable takeaway. Please use the form on the right to download the PDF for our pick of the 5 most effective ways to close your presentation.